Photograph courtesy Graham Turner. 25116 at Derby Works on August 5th 1978, with the No.1 end cab missing. The sixteen and a half year career of D5266/25116 was spent allocated to a variety of London Midland depots. Time between last Classified repair and withdrawal: 57 months. Time between withdrawal & scrapping: 21 months. May 1964 to Derby (16C). January 1965 to Saltley (2E). April 1966 to London Midland Midland Lines (LMML). December 1967 to Nottingham Division (D16). December 1969 to Manchester Division (D09). 25116 was the 57th Class 25 withdrawn, one of seventeen retired during November 1980, including shedmate 25112. At withdrawal 25116 was briefly stored at Springs Branch before moving with 25047/74/99 to Swindon Works on November 21st 1980. 25116 was scrapped here by the end of July 1982. Noted Crewe Works January 1969. Noted Derby Works January 1976 (Classified). Noted Derby Works August 1978 - January 1979 (accident repair). On August 24th 1968 5266 recorded its first known passenger working, the round trip Nottingham - Llandudno Town summer dated service with 5196. On April 4th the 09.05 Euston - Blackpool South was worked forward from Preston by 5266. On June 10th 5266 & 5284 worked the 13.50 Derby - St. Pancras throughout. On July 12th the 19.25 Sheffield - St. Pancras was worked to Nottingham by 5266. On September 2nd 5266 & 7564 worked the Derby - Norwich - Yarmouth - Norwich - Walsall diagram. A day excursion on May 27th saw 5266 & 5237 work a Leicester - Yarmouth roundtrip (presumed). At the end of the summer season, on September 29th 5266 & 5271 worked the 08.00 Walsall - Yarmouth to Norwich and is presumed to have returned on the 14.30 ex-Yarmouth. 25116 worked a Doncaster - Newcastle parcels on May 10th. 25116 was noted at Tyne Yard on November 24th. On July 18th the 21.20 Kensington Olympia - Perth motorail was worked to Willesden by 25116 & 25071. July 29th was probably a typical day at Nuneaton, being noted were returning empty ballast workings with 25150 from Beighton Junction, 25046 from Bordesley Junction and 25116 from Lenton, with two Class 31 hauled workings from the southern end of the Eastern Region. On July 3rd 25116 & 25276 are assumed to have worked the 08.45 Birmingham New Street - Barmouth forward from Shrewsbury since they were noted on the return working, the 17.30 Barmouth - Birmingham New Street as far as Shrewsbury. 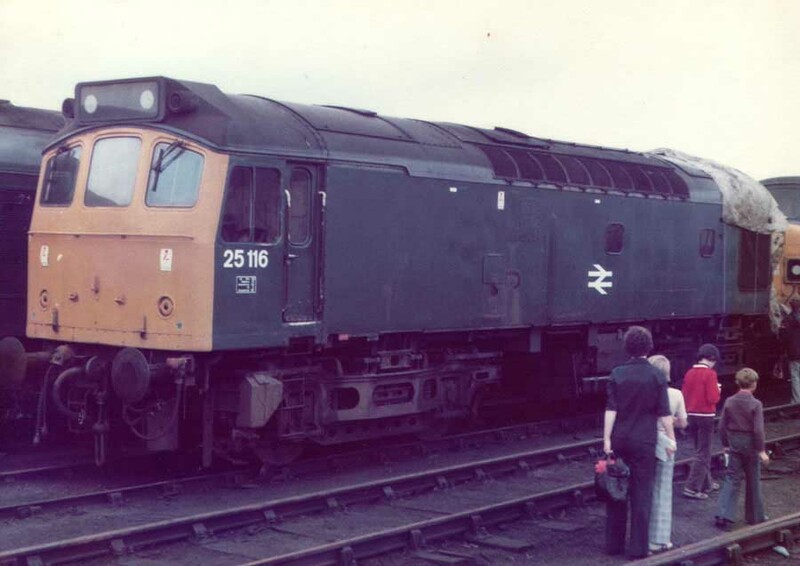 25116 was one of four Class 25s stabled at Nuneaton on August 29th. Two months later on September 3rd 25116 & 25243 worked the 08.52 Leicester - Skegness to Nottingham, they were replaced here by 47325. Breakfast time on June 27th found the 03.58 Ripple Lane - Hawksbury oil train derailing five of its wagons at the site of Brandon & Wolston station (between Coventry & Rugby), destroying several hundred yards of the down line. The rerailing coach from Saltley arrived quickly behind 25142, the line being cleared early on 28th, leaving room for 25116 & 25190 to bring in a train of fresh ballast. The final recorded passenger working for 25116 took place on August 2nd with 25116 & 25129 working the Derby - Norwich - Yarmouth - Norwich - Walsall diagram. 25116 was withdrawn on November 2nd 1980. A shortage of locomotives in November led to at least ten Class 46s being reactivated from Swindon. For this 25116 & 25197 were used to assist in reviving these Type 4s prior to their return to Gateshead. Page added March 24th 2013.